Home › Blog › Marketing › Hitchhiker’s Guide to the Google Penalty: Has Your Website Been Penalized? So your website has dropped a few rankings in Google search results. Not a big deal (though you should fix the problem if you can). A much, much bigger deal? Getting hit with an actual Google penalty, where Google removes your website from search results or severely lowers your rankings. How does this happen? What can you do to prevent it? And, if you’ve already been penalized, what can you do to fix the problem? You can lose Google rankings for a number of reasons: algorithm updates, search behavior changes, or hackers. Here’s a handy checklist of questions that can help you figure out if your website has been targeted by a Google penalty – and, if so, what you can do about it. What’s A Google Penalty, Anyway? 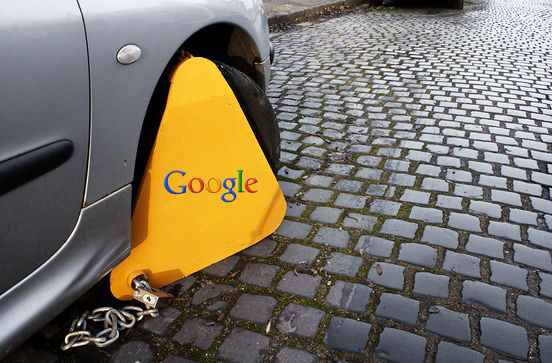 There are two basic types of Google penalties: algorithm-based and manual. The first type of penalty occurs when Google makes some sort of update that targets new kinds of sites. For example, the recent Penguin update searched for sites with too many over-optimized links (large numbers of exact-match anchor text links pointing back to the website). If a site sells refrigerators, and it has 10,000 backlinks with the anchor text “refrigerators,” most likely, this site would suffer a penalty. The other type of penalty is manual – the Google Search Quality Team looks for sites that don’t comply with Google’s webmaster guidelines, and individually penalizes those sites. What Happens When You Get A Google Penalty? Best-case scenario: you suffer a moderate to severe drop in search rankings. Worst-case scenario: Google completely removes you from the index. You never, ever want to get kicked off the index – it can be a death-blow for your business. How Can You Tell If You’ve Been Penalized? Suffered a recent rankings drop? This checklist will help you figure out what – if anything – you’ve done wrong. Check your traffic data on Google analytics. If you’ve experienced a sharp drop-off over a short period of time, chances are good you’ve been penalized. How Do You Get Rid of a Google Penalty? If you’ve figured out your problem and taken steps to fix it, you can submit a Reconsideration Request to Google. Google recommends that you only submit one of these if you’ve suffered a manual penalty, but there’s no penalty for sending one in. Submit your Reconsideration Request through your GWT account. Just like the penalties, the responses are manual, so be prepared to wait a while for an answer. Once you’ve submitted your Reconsideration Request, you’ll get one of two answers. Hopefully, Google will say they’ve removed a manual penalty and restored your rankings. But they could also tell you that your site was targeted due to an algorithm update, and all you can do to improve your rankings is (wait for it) improve your site. That’s really the end goal of all these Google penalties: make sure you have a high-quality site with outstanding design, content and usability. If your site is outstanding, without gimmicks or unnecessary backlinks, then you have a much better chance of staying on top of the rankings game. For some tips on improving your website, click here.